We respect the privacy of all of our customers. We DO NOT share ANY of your personal information with any other companies, however we do share anonymous information with a third party to help improve our services we offer to you, this information can be found below in the cookies policy. We use MailChimp for sending out newsletters, You are automatically added to this on registration. As we use Paypal for our payment method, Paypal will have their own terms and conditions on how they treat manage information you supply to them for payment. This information can be found by clicking on the image below. We provide services and our goal is to make them easy, useful and reliable. This sometimes involves placing small amounts of information on your device, for example, computer or mobile phone. These include small files known as cookies. They cannot be used to identify you personally. 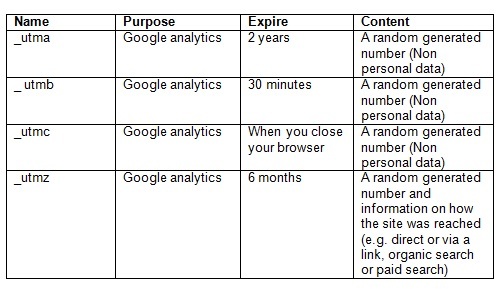 The cookies in the table below are set by the Google analytics tool for improving service which allows the website to accurately estimate the number of visitors to the website, volumes of usage and ensure that the website is available and that ATOS understands what the user want to use.